I read this article and found it very interesting, thought it might be something for you. The article is called How UP Beats Maharashtra, Gujarat In Agriculture Productivity and is located at https://archive.indiaspend.com/sectors/how-up-beats-maharashtra-gujarat-in-agriculture-productivity. IndiaSpend’s Dhritiman Gupta looks at agriculture production across states and contrasts irrigation facilities and agricultural production; and comes away with some interesting findings. Punjab and Haryana are by far the most agriculturally productive states in the country. And also with the highest irrigation reach. Not surprising perhaps. But what might be surprising – particularly to the uninitiated – is that Uttar Pradesh, Andhra Pradesh and Bihar are the next in the list with irrigation reach ranging from 75% to 64%. Maharashtra figures way down the list with barely 16.8% of cultivable land being irrigated. First we will look at the all-India figures for the last 10 years. The first thing to take away from (Table 1) is that India has failed to provide irrigation support to its farmers. In 2000-01 about 43.4% of the cultivated land had irrigation facilities. Almost a whole decade later, in 2008-09, only 48.3% of the cultivated area came under irrigation. Not surprisingly, Indian farmers are still exposed to the vagaries of the monsoons. That they are is quite apparent from the fluctuations in agricultural production. Even though production rose from 196 million tonnes in 2000-01 to 241 million tonnes in 2010-11, the fluctuations within the period are huge. Agricultural production fell from 212 million tonnes in 2001-02 to 174 million tonnes in 2002-03. Between 2003-04 and 2004-05, production fell by 15 million tonnes. The fluctuations continued till as late as 2009-10. Agricultural production fell from 234 million tonnes in 2008-09 to 218 million tonnes in 2009-10. Productivity has hovered around an average of 1.7 tonnes per hectare over 2000-11. But even productivity has shown regular fluctuations. Over the decade, productivity varied between 1.5 million tonnes to 1.9 million tonnes. A first guess toward explaining such fluctuation again has to be uncertain monsoons and use of relatively backward techniques. As we saw in a previous article, an average productivity of 1.7 tonnes per hectare was quite poor when compared to of countries like Australia, Israel and even Peru and Nicaragua. Before going into the state-wise comparison along similar lines, let us look at the states India depends on for its agriculture. For this purpose we will look at the 3 best producing states across crops. As can be seen from (Table 2) India depends on a handful of states for its agricultural production, Uttar Pradesh being the undisputed leader. And across crops, the top 3 states dominate the bulk of production. In the food grains category, the top 3 states account for almost 40% of the production. In oilseeds, the figure is 60.8%. The number jumps to 70.3% if we consider cotton. A handful of states like Uttar Pradesh, Punjab and Madhya Pradesh produce the most in the agricultural sector. Food security being one of the main concerns of policy makers, we will restrict our attention to food grains production from here on. We will try to link productivity in food grains and irrigation coverage of the state. We will take the year 2008-09 for the purpose because irrigation coverage data is not available after that year. The states have been ranked according to irrigation coverage, from top to bottom. Data is available for 17 states. Even though irrigation is not the only factor which affects productivity, others being quality of soil, use of fertilisers, education of farmers et cetera, it actually to some extent enhances productivity. A look at (Table 3) confirms that. The first thing to note is that only 6 states had more than 60% irrigation coverage in 2008-09. Then there is a drastic drop. 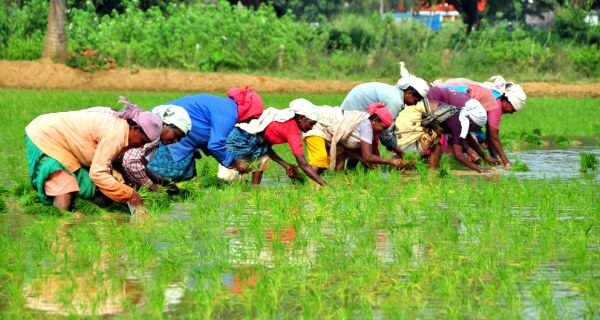 The 7th state West Bengal only had 48.2% of its cultivated land under irrigation. Maharashtra ranked 15th with only 16.8% of its cultivated land under irrigation. With the exception of West Bengal with a productivity of 2.4 tonnes per hectare, all states with lower than 60% irrigation coverage had productivity below 2 tonnes per hectare. The productivity in Maharashtra was just about 1.0 tonne per hectare. Bihar, on the other hand, is an exception of the other sort. Despite having more than 60% irrigation coverage the productivity was only 1.7 tonnes per hectare. This could be due to illiteracy of farmers but the necessary infrastructure to bounce back is in place. Bihar’s agriculture growth rate over 2004-2010 has in fact been the fastest in the country – at 8.1%. IndiaSpend has been writing on the relation between agricultural output and irrigation in the past. The current study looks at the state-wise role in national agricultural output. The reasons may vary (and nature might play a role) but it’s interesting that industrially advanced states like Maharashtra & Gujarat have not been as proficient in irrigation reach. Recent investigations into irrigation projects in Maharashtra perhaps suggest why, at least for one state. How can u compare productivity of northern plains – blessed with rich fertile soils and a year round supply of waters from rivers originating from Himalayas with that of arid and rocky lands of Maharashtra ? The total irrigation potential of Maharashtra is never going to exceed 40 %. I think you are confusing cultivable area (or arable land area) with area under irrigation. While the proportion of cultivable land would be less in states like Maharashtra, theoretically the proportion of land under irrigation can go upto 100 %. Given that most of India receives atleast 25 inches of rain, the low area under irrigation has more to do with politics and water management than nature. Otherwise, Assam, which receives massive rainfall and has the perennial Brahmaputra flowing through it would not have a paltry 4% area under irrigation.